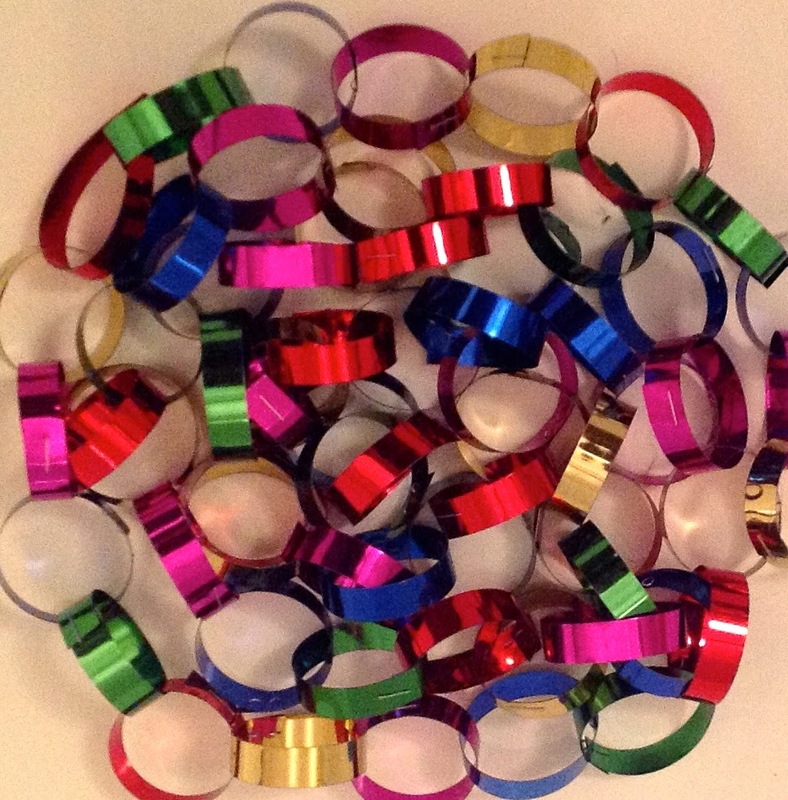 Our competitions are open to UK readers only - sorry! "If you were designing a Magna Carta for today, what would your first clause be?" Please also send your answer to maryhoffman@maryhoffman.co.uk so that I can contact you if you win. Closing date extended to 14th January. 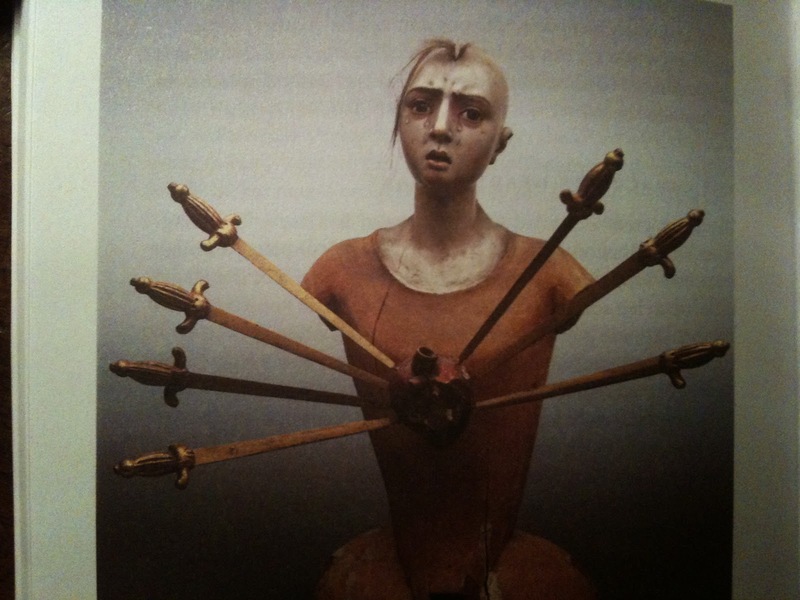 My proposal for the Cabinet of Curiosities is one of the most curious items I have ever come across: the human heart. We all have one; most of us will never see one. We all know what it is, very few of us can explain how it works. There exists a universal fascination with it which no other organ shares, not even the brain, so complex and mysterious, and only now beginning to give up its secrets. The future may belong to the brain, but the past belongs to the heart. 'Both,' I would reply, because the heart is above all two things at once: full and empty, moving and still, left and right, ventricles and atria, physical and spiritual, red and blue, oxygenated and non-oxygenated, body and soul, sacred and profane, god and man, hard and soft, recipient and creative, male and female, suction and expulsion. It is a muscle, a pump for blood, and yet it is the home of love, courage and religion; it is full of blood and of symbolism. 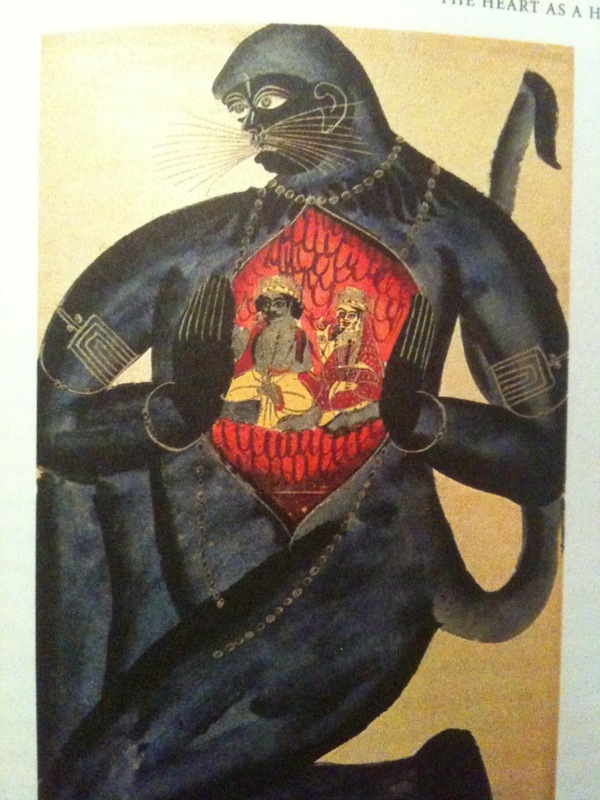 Every age, every culture and every religion has ideas and beliefs about the heart which support, overlap and undermine each other; we have always known the heart's vital importance, and assigned similar reasons for it. I divided the book into four sections - like the four chambers - and filled them with Anatomy, Religion, Art and Love, but they kept overlapping. 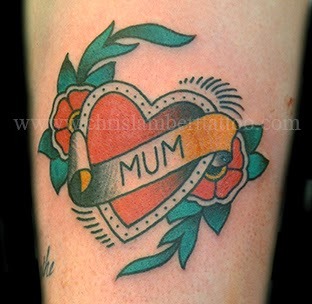 But why the heart? Imagine you are a neanderthal. . . what do you do? Go hunting? Your heart twitches when you see your prey - a mammoth, say. It beats faster and faster as you run after your mammoth. When you shoot it, where do you aim? You know an animal shot through the heart dies; you know when it dies the beating stops. You drag the mammoth home, heart thumping away with the effort of work. You give it to your family to eat and your heart glows with pride. Your wife takes you aside and makes beautiful love to you in gratitude for having brought home the mammoth bacon; again, your heart makes its presence felt. Little wonder that the most ancient cave paintings - in the cavern at Pindal - show a heart (on a mammoth, as it happens) and the earliest written story, Gilgamish, tells of the hero's heart being full of courage as he sets out, and full of affection for his friend. 'Oh Wide-of-Stride who comes from On, I have not done evil. Oh Shadow-eater who comes from the cave, I have not stolen. Oh Lion Twins who some from Heaven, I have not trimmed the measure. Oh Cave-dweller who comes from the west, I have not sulked. Oh Backward-faced one who comes from the pit, I have not copulated with a boy. Oh High of Head who comes from the cave, I have not wanted more than I had. 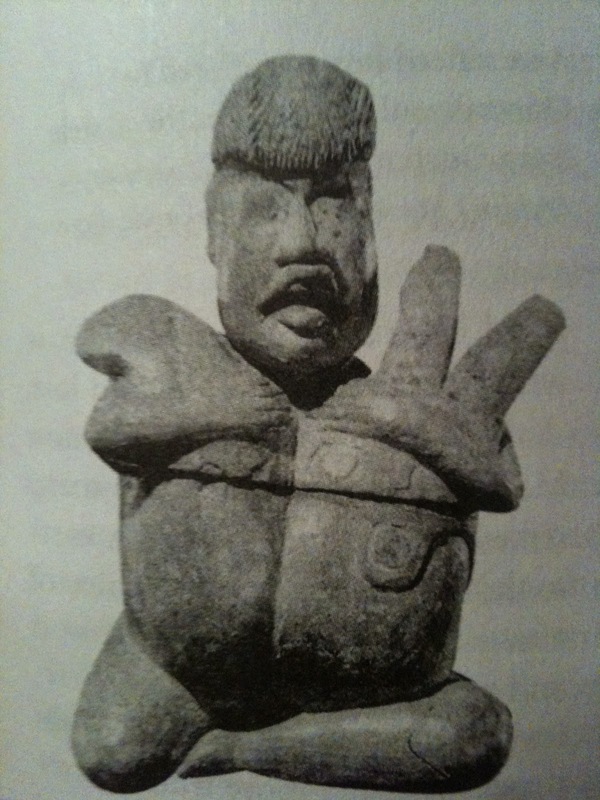 I had an entire chapter on the pre-biblical origins of Country and Western lyrics, with a section on Hank Williams's Your Cheatin' Heart - 'Your cheating heart will make you weep, you'll cry and cry and try to sleep, but sleep won't come, the whole night through - Your cheating heart, will tell on you . . . ' You can't tell me that's not about Osiris. Which leads to all kinds of things . . . . 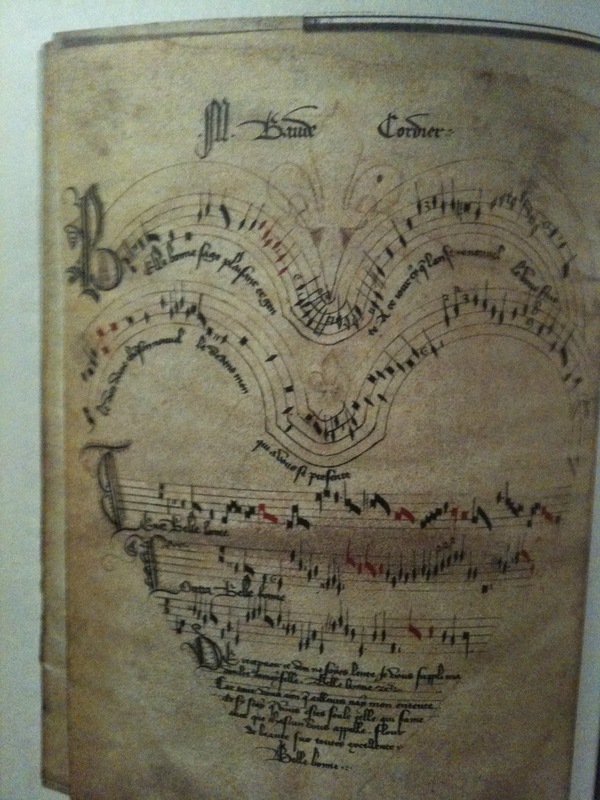 Here is a piece of work by an anonymous nun of the late 15th century. Forgive my bad photograph. 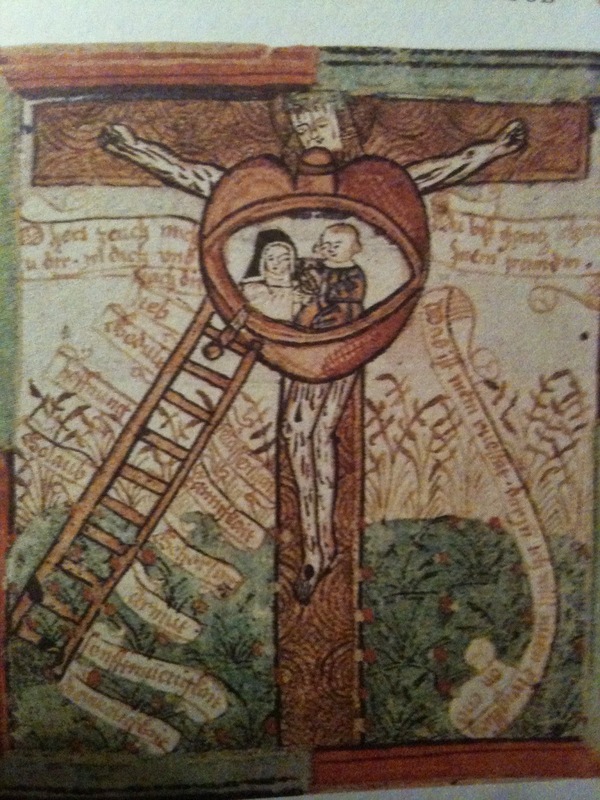 The heart is a house; the aorta is a chimney (with the Lamb of God sitting on top). Steps lead up to the door and inside the nun sits on Christ's knee, with God the Father embracing her and the Holy Spirit perching by her. She has even let her hair down and taken off her veil. 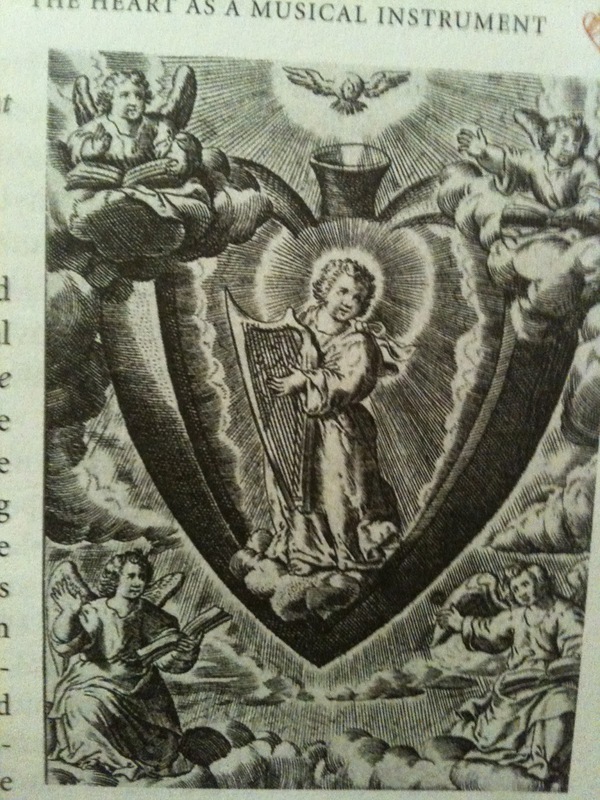 Top right you may make out St Walburga and her host of 144,000 virgins arriving on a cloud. A tiny dog protects the doorway. It is truly a heart full of love, a safe place to spend eternity. 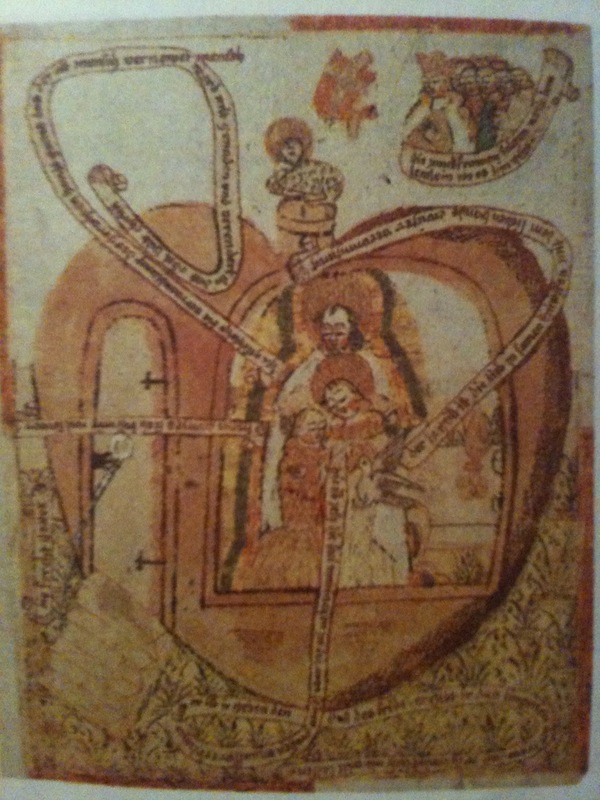 The same nun made this: The heart of Christ on the cross. 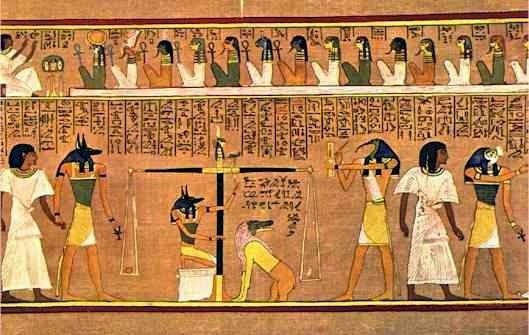 The ladder leading up is labelled step by step with virtues you need to have in order to reach the happy state of union with God inside his heart. 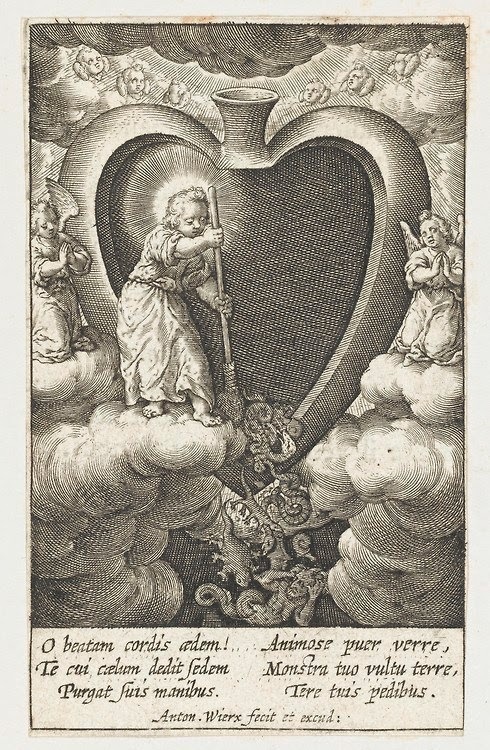 Here is the most wounded of wounded hearts, that of Mary, with her seven sorrows, each one a blade: this is a 17th-century Italian depiciton. She would have had a wig and a skirt. 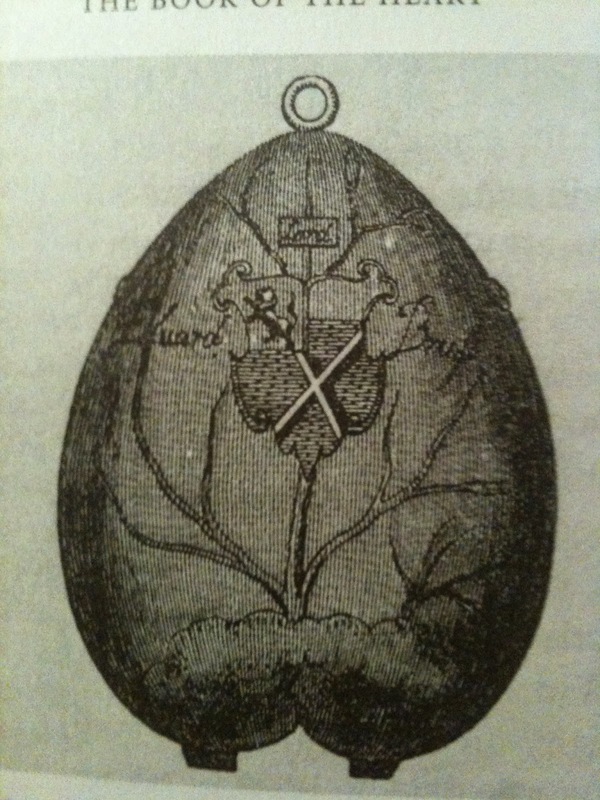 Here it's a pomegranate, split open to presage Christ's passion on the cross, when his heart was pierced by the spear of the soldier Longinus (knowing this would happen is one of Mary's sorrows, see above). Broken hearts of course had a chapter to themselves. or a song . . . .
or a musical instrument. See those heartstrings go Zing. . . .
Or it can be a locket to keep a real heart in. This one contained the heart of Edward, Lord Bruce of Kinloss, who took exception to Sir Edward Sackvile's contention that Scotsmen were beggarly, and as a result died in a duel at Bergen. There's a reason why it's upside down, by our standards. I could tell you why. I could tell you why the heart has a pointy bottom and scallopy top, too, despite looking in reality like a meat whoopie cushion. And why it has two sides. And . . . all kinds of things. 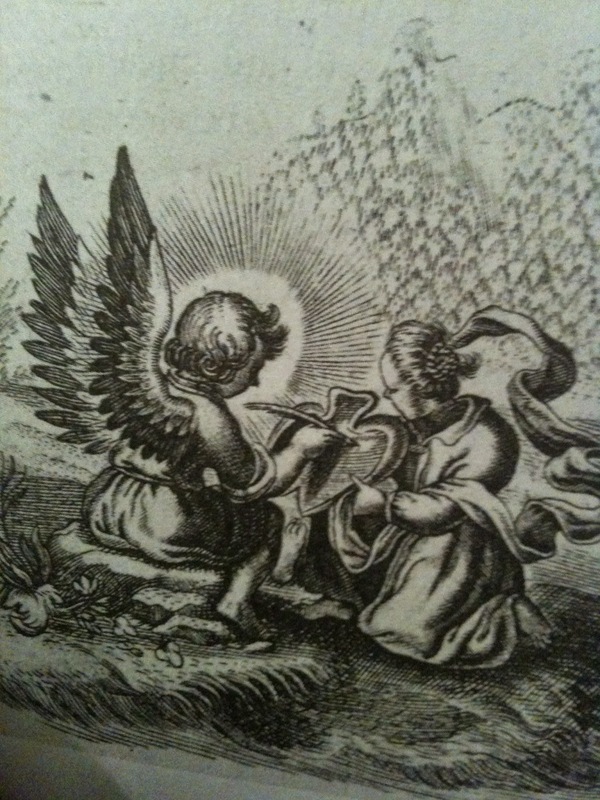 If truly 'the heart of him that hath understanding seeks knowledge' (Proverbs, 15.14), just ask. Have I convinced you? Is the heart curious? Does it not deserve a place in our cabinet? 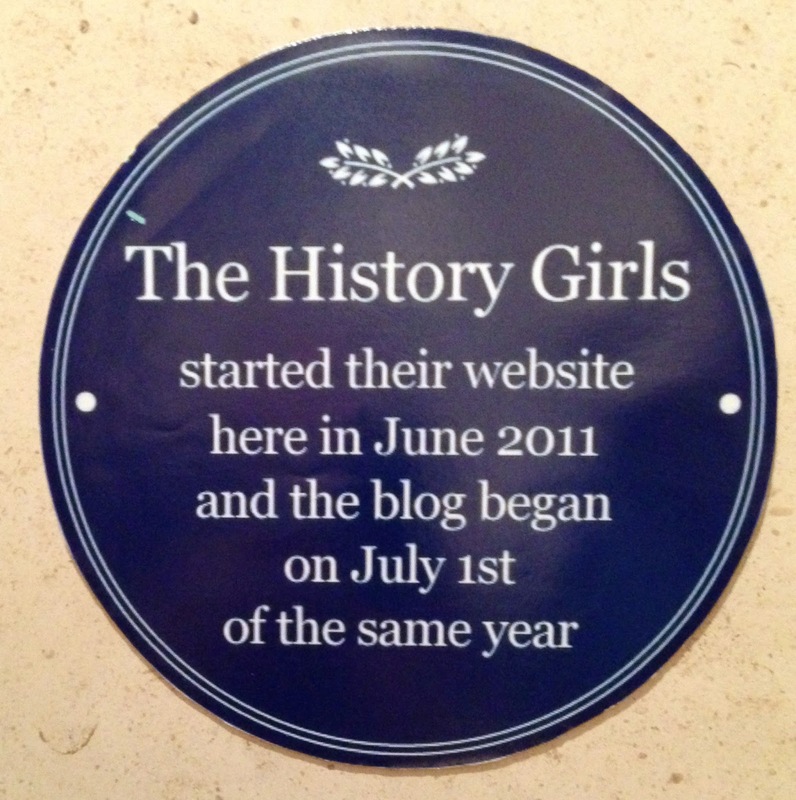 We are delighted that this month’s guest post on The History Girls comes courtesy of Dan Jones author of The Plantagenets and presenter of the recent Channel 5 series about them called "Britain's Bloodiest Dynasty." He was kind enough to take some time out of a hectic schedule to answer a few questions posed by Elizabeth Chadwick on his excellent new book about the Magna Carta. 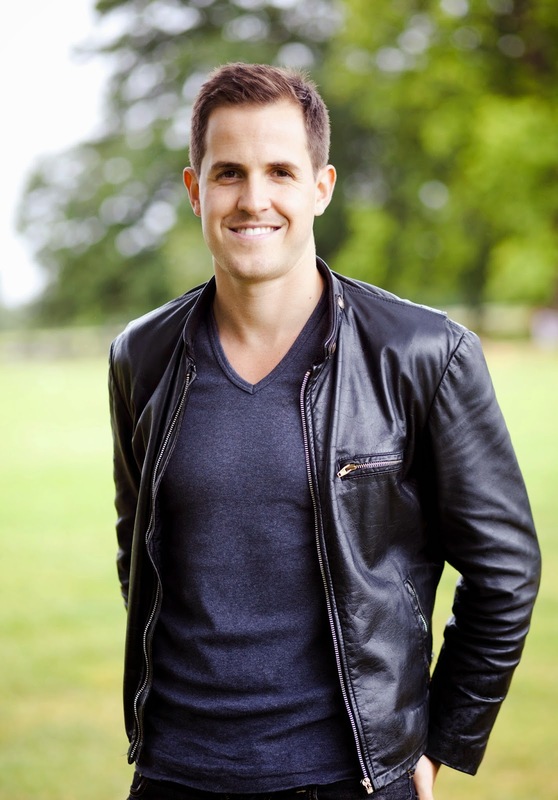 Dan Jones is the author of The Plantagenets and The Hollow Crown, both of which were Sunday Times bestsellers. As a journalist he writes regularly for The Sunday Times, Mail on Sunday, Daily Telegraph, Spectator and is a columnist at the London Evening Standard. He has presented television programmes for the BBC and Channel 5 – most recently ‘Britain’s Bloodiest Dynasty: The Plantagenets (2014) and ‘Great British Castles’ (2015). In 2015 as part of the 800th anniversary celebrations Dan will be taking part in the British Library’s exhibition of the charter, appearing in events nationwide, and giving a TED talk on the subject. He lives in London with his wife and children and tweets as @dgjones. Elizabeth Chadwick: In the summer of 1214, the year before Magna Carta was signed, a very significant battle, still commemorated by the French was fought near a place called Bouvines. King John was attempting to regain the continental dominions he had lost to the French almost ten years earlier. John and his allies suffered a catastrophic defeat at the hands of the French. If there had been a different outcome to the Battle of Bouvines, or if King John had had a slightly less difficult character, do you think Magna Carta would not have happened - or was it inevitable? Dan Jones: I guess this strikes right at the heart of Magna Carta: it was both a complaint against (and an attempt to correct) King John himself, and a howl of protest addressed at sixty years of Plantagenet (aka Angevin) government, going back to the accession of Henry II in 1154. The catastrophic loss at Bouvines certainly made things awkward for John in the autumn of 1214, and although John struggled against it for nine months into the spring of 1215, I think that some form of serious reckoning was inevitable after that loss. John’s personality certainly contributed substantially to his problems. It wasn’t that he was massively more monstrous than his father or his brother Richard I – but he lacked many of their redeeming qualities, AND he was thrust into much closer contact with his English subjects than either of his predecessors, because he had lost Normandy. To put it crudely, he was up in their faces all the time. 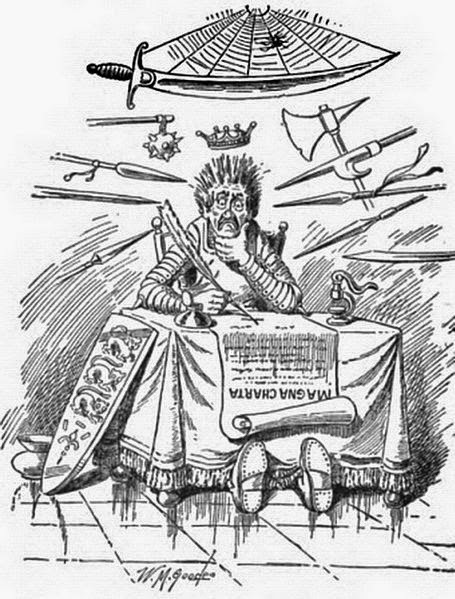 Can we imagine a more benevolent, more militarily successful king John, who would have died in 1216 having driven the controversial Angevin system of government for a decade and a half without having been forced to agree Magna Carta? Yes, easily. But then I should think that the reckoning would probably have come during the reign of John’s son, Henry III. Elizabeth Chadwick: Magna Carta often mentions the ‘ancient customs’ of the realm. Just how far back in the mindset of the barons involved in creating Magna Carta did these ancient customs go? Dan Jones: People love to bang on about the good old days, don’t they? When your money went further, and the summers were hotter, and there weren’t so many foreigners… Those complaints (minus the stuff about the summers) were as common in 1215 as they are today. If we were going to put a date on it, then the barons were looking to the days of Henry I (1100-1135) for their inspiration – Henry I’s coronation charter was well known and was actually included in draft treaties that were drawn up for debate in the months and weeks before Magna Carta. But this isn’t the same as saying that the barons wanted to turn the clock back 115 years to 1100, and be done with it. Magna Carta was looking for reform in a partially imagined past, and its ‘ancient customs’ were not necessarily or wholly ancient. Elizabeth Chadwick: The Church clearly placed itself in prime position with regard to the Magna Carta clauses and also ensured that the charter both began and ended with matters of ecclesiastical importance. Were the other clauses in the charter arranged in order of importance or just as they were thought about? Dan Jones: You’re right – the hand of Archbishop Stephen Langton can be felt all over Magna Carta - the freedom of the Church is given pride of place and is restated at the end. Is there a logical flow to the rest of the 63 clauses (or chapters)? Not really – clauses are grouped together thematically, but when you read the charter aloud in its entirety (as I just did for the audiobook) you also get the powerful sense of this charter as unfinished business – slightly ragged, swarming with competing agendas and full of compromise. It was, after all, a peace treaty. Elizabeth Chadwick: Stephen Langton, Archbishop of Canterbury was the ‘chair’ of the committee so to speak, but do we know which of the barons were most instrumental in bringing about the wording and content of these clauses? For example, I know that father and son Roger and Hugh Bigod had a good grasp of the law, the former having been an itinerant judge hearing pleas in the reign of King Richard and being a man with a keen eye to his own rights and personal advancement. I just wondered if there were any pointers to who the biggest movers and shakers were among those who hammered out the wording of Magna Carta? Dan Jones: We absolutely do know who was involved in drawing up Magna Carta – and on both sides. The charter names more than two dozen men who advised the king – they include the great knight-turned-baron William Marshal, earl of Pembroke, the king’s half-brother William Longsword, earl of Salisbury, and a large number of English and Irish clergymen, including the archbishop of Dublin and the Master of the Templars. 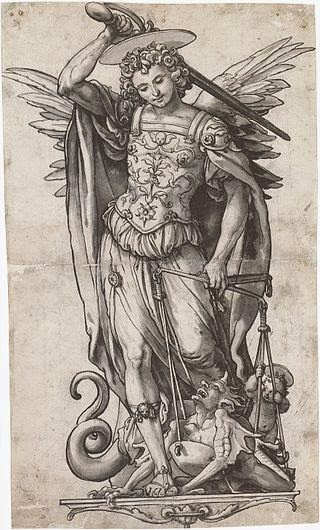 On the barons’ side, we have a list of the twenty-five noblemen who were appointed as enforcers of the charter – this was preserved by the chronicler Matthew Paris. You’re right to mention the Bigod family. Other notable figures included Robert FitzWalter, lord of Dunmow and Eustace de Vesci – two barons who had been agitating against John since 1212 when they had been at the heart of a plot to assassinate him. They also included the earls of Oxford, Clare, Essex, Winchester and Hereford, and the Mayor of London, Serlo the Mercer, who was presumably one of those who lobbied so hard for the explicit recognition of London’s liberties in Magna Carta. 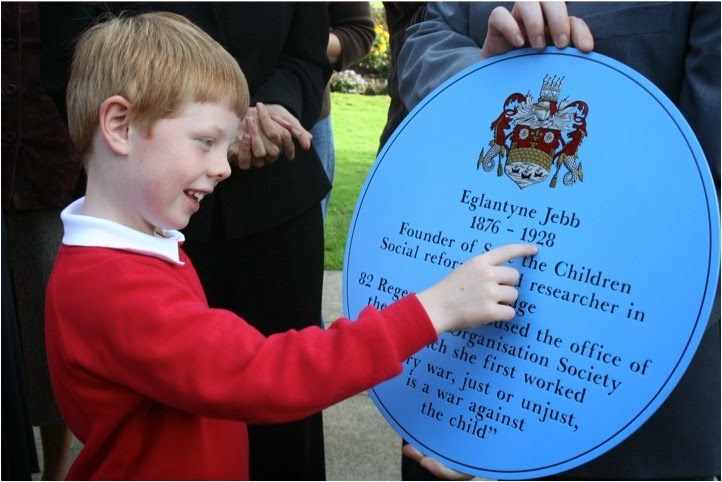 Elizabeth Chadwick: Do you think that if Sir Edward Coke had not ‘rediscovered’ and promoted Magna Carta in the 16th century during the reigns of James I and Charles I that it would have sunk further into obscurity? Obviously he revived it and used it to boost the efforts to bind the Stuart kings to principles of government, but how much awareness was there of the document at that time among his peers? Dan Jones: Well, by Coke’s time Magna Carta had been circulating in printed form for more than a century (it was first printed by Richard Pynson in 1508), but it had understandably not been very popular during the Tudor years. 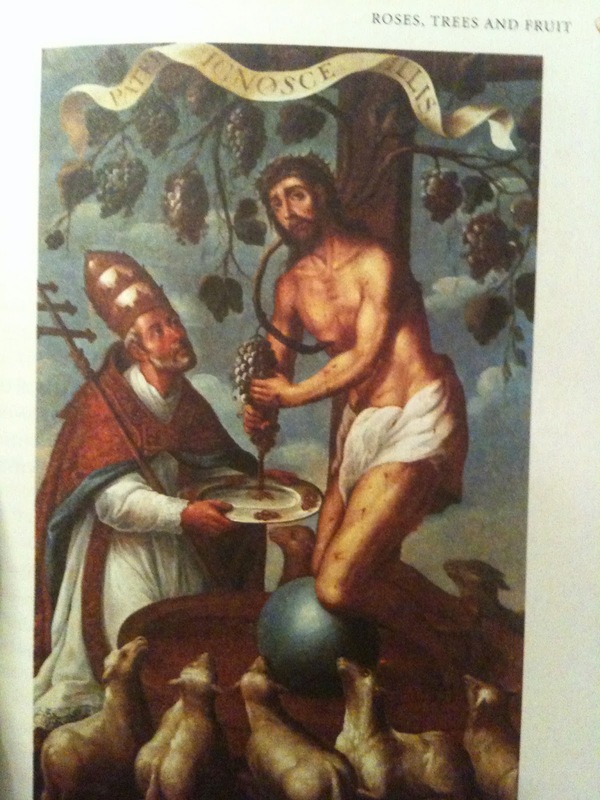 All that stuff about restraining kings and guaranteeing the freedom of the English Church was a bit… risqué. Look at Shakespeare’s King John, written probably in the 1590s – no mention at all of Magna Carta there. So the charter owes much to Coke for reviving it and making it a symbolic part of a political argument far removed from the circumstances of Magna Carta’s creation. 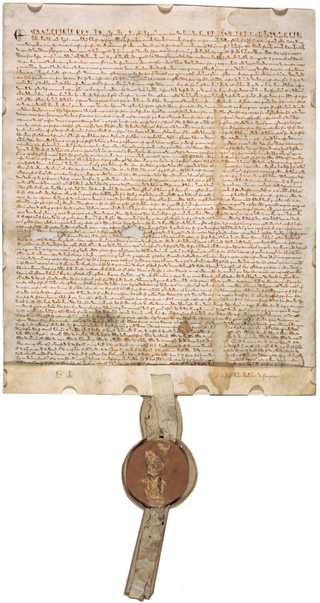 But the whole story of Magna Carta – in a sense, right from the first reissue in 1216 – is of it being revived, turned to another purpose and consequently mythologised. Coke was perhaps the most important figure of all in this process, along with our American cousins who adopted Magna Carta as their model as they thrashed out the US Constitution and Bill of Rights. But the process rumbles on even today, when Sir Tim Berners Lee calls for a Magna Carta For The Web, or Jay-Z uses ‘Magna Carta’ as the name of his album to suggest himself rewriting the rules of the music industry. Elizabeth Chadwick: Although clauses 39 and 40 are the most well known and most often quoted – for example number 40: “To no free man will we sell, to no one will we deny or delay, right or justice” - do you have a favourite clause of your own or one that especially interests you? If so will you tell us about it? Dan Jones: I love the clause banning fish weirs in the Thames and Medway. (Clause 33). Partly because it speaks to the arcane and peculiarly ‘medieval’ nature of so much of Magna Carta’s content. And partly because as soon as you think about it, you conjure up a clear picture of the world of Magna Carta: wooden fish-traps placed along the rivers were a blight to the boats that relied on the south-east’s main waterways. There – now we’re out of the dusty world of ink on parchment and aboard a boat working its way along a tidal river. That’s the humanity that throbs beneath Magna Carta. 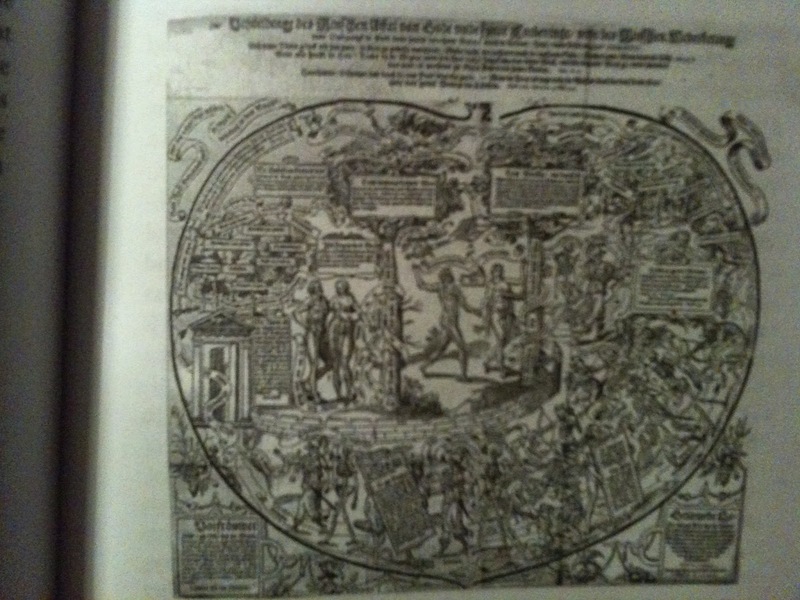 Elizabeth Chadwick: You have very clearly delineated the mass influence of Magna Carta up to this point in history. How do you see its influence progressing into the digital age for future generations? Dan Jones: Big question and in a sense above my pay grade, but when I consider the circumstances that threw up Magna Carta and the big issues concerning our digital future, I mainly see masses of questions and no easy answers. How do you check massive companies like Google, Amazon, Facebook and so on, whose wealth and power is starting to exceed that of some nation states? How do you regulate the regulators? What rights and liberties do we really all have in common? Who’s going to get rid of the fish-traps on the Thames and Medway? No, wait, I think we sorted that one. These quiet days, between one set of sparkliness and another, are one of my favourite times of year. Nothing showy for you today, just this, sent by a friend when my mother died, four weeks ago. 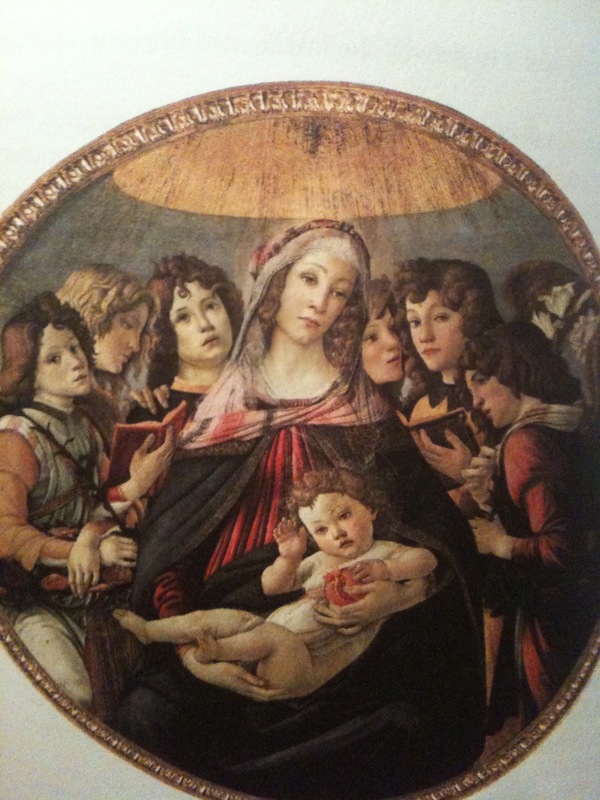 The veiled evangel of your mysteries. In lone remote migration beating by. Teach me to travel far and bear my loads. On Christmas Eve 1914 in northern France a frost set in. It had been raining for weeks, filling the trenches to waist height with water, soaking spirits, drowning hope. So acute was this drop in temperature, that it froze solid the soldiers’ great coats and hardened their boots. The men themselves were "frozen to the marrow". Soldiers from both camps rose cautiously from their trenches, climbed up and started to walk in No Man’s Land, unarmed, some bearing white flags. The frosty weather had dried the filthy mud solid. 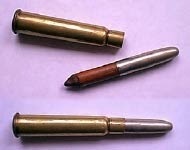 It facilitated the soldiers' passage across the free zone. Exiting their trenches was counter to the orders given by many, although not all, superior officers on both sides of the war – “no fraternising’ - but the men were ready for respite, a few hours of peace. It was Christmas, after all, and it seemed a perfect moment to remember those who had died or were missing and loved ones back home. They shook hands with their enemies, then smoked cigarettes or cigars, sipped schnapps, sang songs - ragtime, Christmas Carols, Music Hall ditties, and even played football (in some cases using sandwiches for balls). Allies and Germans together. Peace for a few hours. Some exchanged gifts (chocolate cake, tobacco). One unit was offered a gift of two barrels of French beer by the Germans which they rolled back to their trench and consumed. Later, the Germans called out to the Tommies. How's the beer? They and their enemy were in agreement that the French beer was lousy. Some shared thoughts of their families, showed photographs of their sweethearts back home, waiting and praying for their safe return. Others enquired of the status of certain of their comrades. The Germans were able to confirm that this soldier or that officer had died and had been buried, or they, Brits and Germans, gave permission for their enemies to bury their dead. There were bodies strewn everywhere about them, lying in the hoar frost. These hours were precious. Moments of humanity in a chaos of destruction. I have read accounts - extracts from letters, diaries, witness statements - stating that this day, this truce, was one of the most abiding and for some, haunting, memories of the war. Boxing Day, the men were mostly back in their positions, rifles at the ready, to shoot one another again. A few held off, not wishing to be the first to fire. An interesting historical fact. Not one single soldier of any rank was disciplined for having taken part in the truce. However, the following Christmas it was made clear that no such fraternisation would be tolerated. Politicians and soldiers alike had been certain that by December 1914 the war would be over. Instead, hundreds of thousands of men from both sides were still in France, stuck in the trenches, frost-bitten, shocked by the number of lives already lost and those that had gone missing in action. It was evident that this war was certainly not going to be a ‘couple of months affair’. Princess Mary's royal gift box with her embossed head. This first wartime Christmas was marked by the British royal family posting out gifts to members of the British, Colonial and Indian Armed Forces, fighting on land or at sea. The gifts arrived in brass tins and were embossed with the head of Princess Mary. 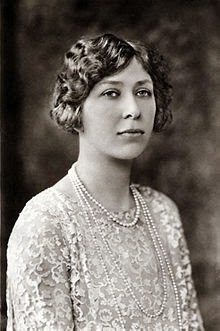 Seventeen-year-old Princess Mary, third child and only daughter of King George V and Queen Mary, was the founder of the Sailors and Soldiers Christmas Fund. She organised a public appeal to raise sufficient funds to ensure that ‘every Sailor afloat and every Soldier at the front’ receives a Christmas present from the nation. The appeal was so successful, raising £162,591 -12s - 5d, that the eligibility for the gift was widened to include every person ‘wearing the King’s uniform on Christmas Day 1914’. This embraced over two and a half million men and women. But such a vast number of gift boxes could not be made ready in time for Christma Day. So, the recipients were divied into three classes. Class A received their gifts on or about Christmas Day and each box included a Christmas card. Classes B and C were sent out in January 1915 and included a Victorious NewYear card. 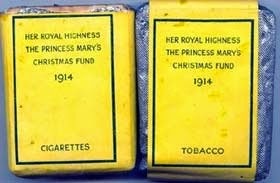 Each box contained one ounce of pipe tobacco, twenty cigarettes, a pipe, a tinder lighter, a Christmas card from the King and Queen and a photograph of, in my opinion, the enormously inspiring young Princess Mary. Non-smokers received a box containing a packet of acid tablets, a khaki writing case containing pencil, paper and envelopes together with the Christmas card and photograph. The Indian soldiers received boiled sweets in their brass 'hampers'. There is a marvellous letter on the website of nature writer Henry Williamson, most famous for his 1927 classic, Tarka the Otter. 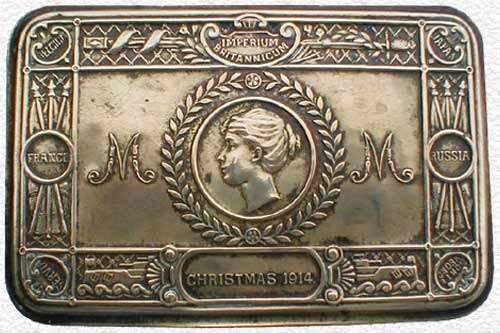 It was penned to his mother on Boxing Day 1914, as the truce was ending and after he had received his tin containing a pipe from the royal family. I am writing from the trenches. It is 11 o'clock in the morning. Beside me is a coke fire, opposite me a 'dug-out' (wet) with straw in it. The ground is sloppy in the actual trench, but frozen elsewhere. In my mouth is a pipe presented by the Princess Mary. In the pipe is tobacco. Of course, you say. But wait. In the pipe is German tobacco. Ha ha, you say, from a prisoner or found in a captured trench. Oh dear, no! From a German soldier. Yes a live German soldier from his own trench. Unbeknownst to Williamson, his letter was sent by his father to the Daily Express who published an abridged version of it in early January. Henry Williamson survived the war but never enjoyed Christmas again. 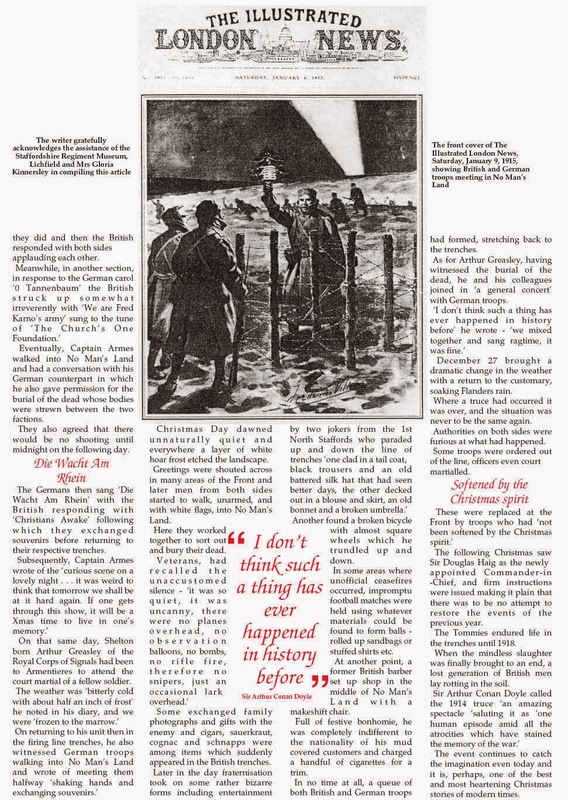 It was a torment for him; every year he relived that 1914 Christmas Truce, when he had spoken to German soldiers and discovered that their hopes and fears were the same as those of himself and his English comrades, and that German soldiers dying in agony cried out for their mothers just as did the English Tommy. 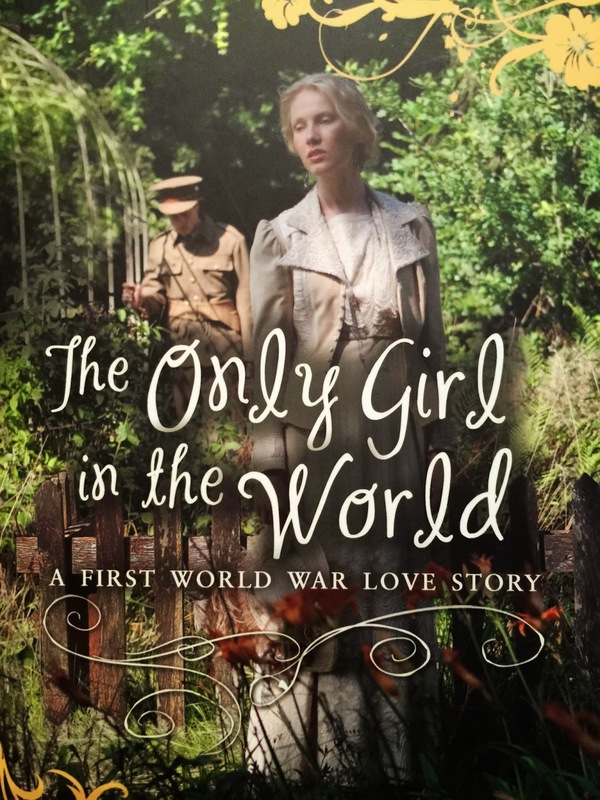 During this WW1 centennial year, Scholastic published my YA novel, The Only Girl in the World. It is the story of a young soldier, Dennis, from London and a French café owner’s daughter, Hélène, from the Somme region who meet and fall in love in 1916. Their story ends in tragedy as Dennis is killed before winter breaks. He does not live to see Christmas. No gift for Dennis from the royal family. A Christmas that Dennis, along with almost every other soldier, believed would be celebrated back home with his family. The third Christmas of that war and the troops were no closer to home. Life in the trenches was endured, as we know, until 1918. The extraordinary spontaneity of that Christmas Truce 1914 was never repeated. Sir Arthur Conan Doyle described it as "one human episode amid all the atrocities which have stained the memory of the war". 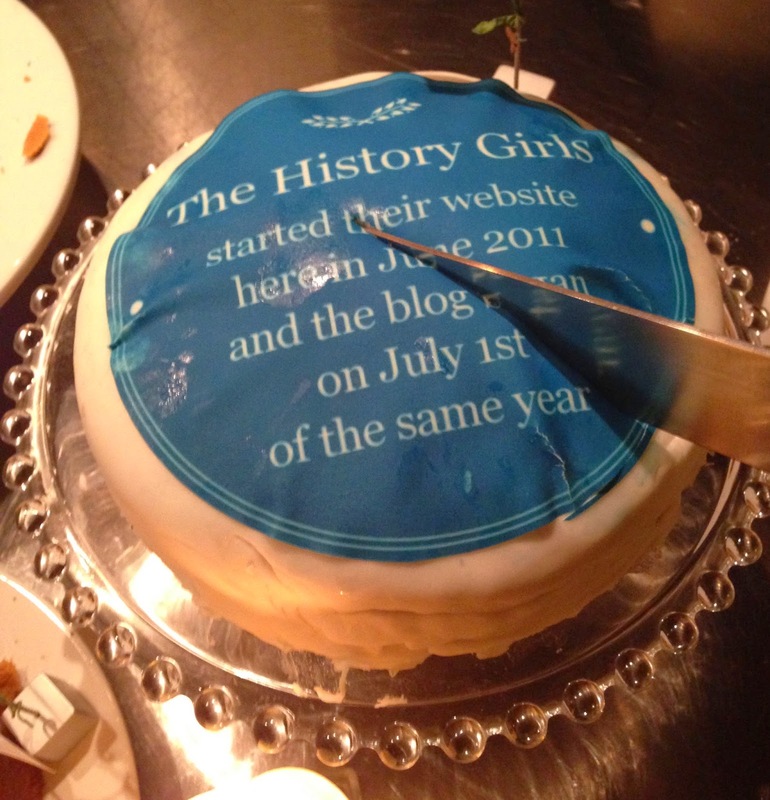 To all reading this, most especially Mary Hoffman and her tremendous line-up of History Girls, I wish you Happy Holidays and a very wonderful and healthy 2015. To all of us everywhere, I pray for Peace on Earth. Merry Christmas, everyone. I hope you are enjoying a stupendous feast today. Of course, this year -perhaps more than most - people are going hungry because of sickness or conflict. So I thought I’d take a look at one such Christmas, if only to give us all a break from that 1914 football match which seems to have taken over all media outlets this week. From September 1870 to January 1871, Paris was under siege by Prussian forces. Almost fifty thousand civilians died, many of them through starvation. Several foreigners were trapped in Paris when the Prussians swooped and, fortunately for us, an English language account of conditions in the city was published shortly after the war. Henry Labouchere, a wealthy British journalist and former MP sent regular reports to his mistress during the war, and brought them together to form The Diary of the Besieged Resident in Paris, published in 1872. All the railways had been disabled, and the roads were blocked, so the only way to get letters out was by carrier pigeon or hot air balloon. 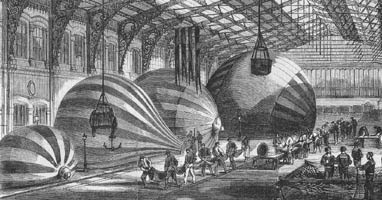 The useless railway stations at the Gare du Nord and the Gare d’Orleans were transformed into balloon factories, and by the end of 1870, a daring postal service with fees and collection routines had been established, and Labouchere made extensive use of it. We are not having a “merry Christmas” and we are not likely to have a happy new year. Christmas is not here the great holiday of the year, as it is in England. Still, everyone in ordinary times tries to have a better dinner than usual, and usually where there are children in a family some attempt is made to amuse them… Since the Empire introduced English ways here, plum-pudding and mince pies have been eaten, and even Christmas-trees have flourished. This year these festive shrubs, as an invention of the detested foe, have been rigidly tabooed. Plum-puddings and mince pies, too, will appear on few tables. In order to comfort the children, the girls are to be given soup tickets to distribute to beggars, and the boys are to have their choice between French and German wooden soldiers. The former treasured up, the latter will be subjected to fearful tortures. Even the midnight mass, which is usually celebrated on Christmas-Eve, took place in very few churches last night. The English here are making feeble attempts to celebrate Christmas correctly. In an English restaurant, two turkeys had been treasured up for the important occasion, but unfortunately a few days ago they anticipated their fate, and most ill-naturedly insisted upon dying. One fortunate Briton has got ten pounds of camel, and has invited about twenty of his countrymen to aid him in devouring this singular substitute for turkey. Another gives himself airs because he has some potted turkey, which is solemnly to be consumed to-day spread on bread. I am myself going to dine with the correspondent of one of your contemporaries. On the same floor as himself lives a family who left Paris before the commencement of the siege. Necessity knows no law; so the other day he opened their door with a certain amount of gentle violence, and after a diligent search, discovered in the larder two onions, some potatoes, and a ham. These, with a fowl, which I believe has been procured honestly, are to constitute our Christmas dinner. You will note the references to rats, kangaroo, and to ‘Elephant consommé. The zoo's two crowd-pulling Elephants Castor and Pollux had been killed for food. Yesterday, I had a slice of Pollux for dinner. Pollux and his brother Castor are two elephants which have been killed. It was tough, coarse, and oily, and I do not recommend English families to eat elephant as long as they can get beef or mutton. It is very strange what opposite opinions one hears about the condition of the poor. Some persons say that there is no distress, others that it cannot be greater. The fact is, the men were never better off, the women and children never so badly off. Every man can have enough to eat and too much to drink by dawdling about with a gun. As his home is cold and cheerless, when he is not on duty he lives at a pothouse. He brings no money to his wife and children, who consequently only just keep body and soul together by going to the national cantinas, where they get soup, and to the Mairies, where they occasionally get an order for bread. Almost all their clothes are in pawn, so how it is they do not positively die of cold I cannot understand. As for fuel, even the wealthy find it difficult to procure it. The Government talks of cutting down all the trees and of giving up all the clothes in pawn; but, with its usual procrastination, it puts off both these measure from day to day. Labouchere’s account is lively and amusing. It’s hard not to take to him as you read. Some years after the siege, he returned to Parliament, and campaigned against fraud and corruption in public life. However he was also profoundly opposed to women’s suffrage, and is credited/blamed, for the parliamentary amendment which outlawed consensual homosexual acts. He lived in Pope’s Villa at Twickenham - rebuilt in High Victorian style, and still a splendid sight from the river today. At my hotel, need I observe that I do not pay my bill, but in hotels the guests may ring in vain now for food. I sleep on credit in a gorgeous bed, a pauper, The room is large, I wish it were smaller, for the firewood comes from trees just cut down, and it takes an hour to get the logs to light, and then they only smoulder, and emit no heat. The thermometer in my grand room, with its silken curtains, us usually at freezing point. Then my clothes - I am seedy, very seedy. When I call upon a friend the porter eyes me distrustfully. In the streets the beggars never ask me for alms; on the contrary, they eye me suspiciously when I approach them, as a possible competitor…As for my linen, I will only say that the washerwomen have struck work, as they have no fuel…For my food…Cat, dog, rat and horse are very well as novelties, but habitually, they do not assimilate with my inner man. I am not intoxicated, but I feel so heavy from having imbibed during the last twenty-four hours more milk than I did during the first six months which I passed in this planet, that I have some difficulty in collection my thoughts in order to write a letter. Yesterday I arrived here in order to breathe for a moment the air of freedom. In vain, my hospitable friends, who have put me up, have offered me wine to drink, and this and that delicacy to eat - I have stuck to eggs, butter, and milk. Patts of butter I have bolted with a greediness which would have done honour to Pickwick’s fat boy. And in fellowship good, we'll part. As the King of the Seasons all! 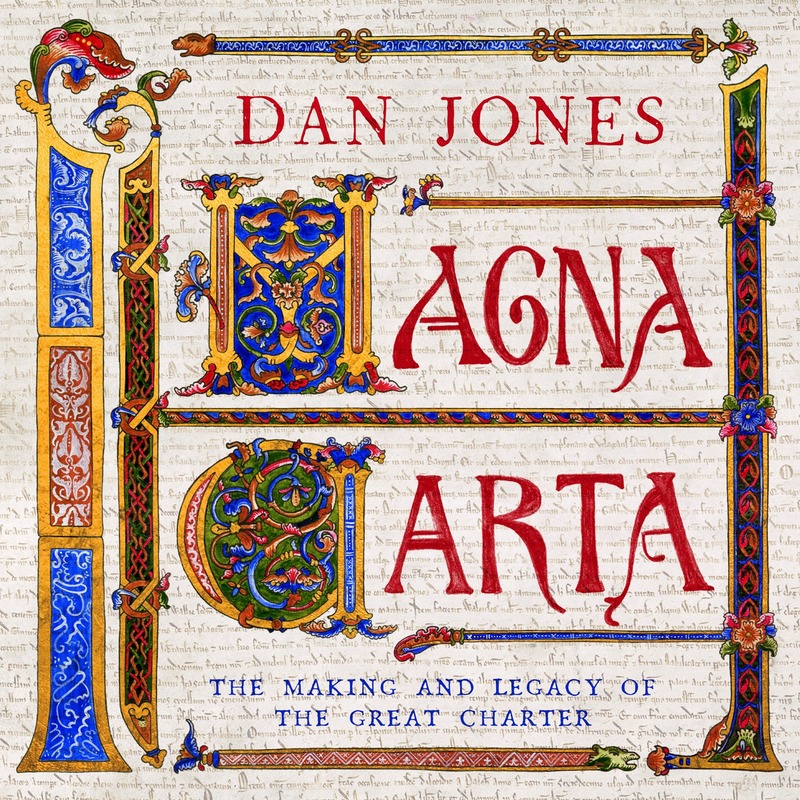 June 2015 sees the 800th anniversary of the signing of Magna Carta at Runnymede and in this book Dan Jones presents a useful guide to bring the general reader up to speed. Dan Jones is of course, the author of the bestselling non fiction work THE PLANTAGENETS which sets out the dynasty's rise to power and eventual ruin over several centuries of medieval British history. The work is also the basis for the recent TV series, written and presented by the author. '"On a summer's day in 1215, a beleaguered English monarch met a group of disgruntled barons in a meadow by the River Thames named Runnymede. Beset by foreign crisis and domestic rebellion, King John was fast running out of options. 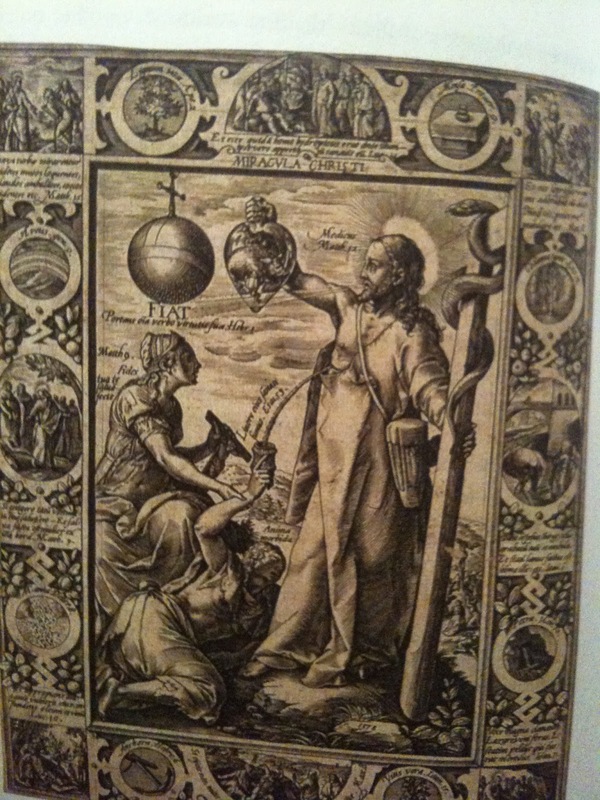 On 15 June he reluctantly agreed to fix his regal seal to a document that would change the world. A milestone in the development of constitutional politics and the rule of the law, the 'Great Charter' established an Englishman's right to Habeas Corpus and set limits to the exercise of royal power. For the first time a group of subjects had forced an English king to agree to a document that limited his powers by law and protected their rights." This book is a joy to read, not just for a medieval-obsessive like myself, but for anyone with a general interest in history. It's one of those reference works that should be on every non fiction bookshelf. The writing style is clean and accessible, edged with dry humour and has broad appeal. Dan Jones educates his readers without patronising, and he never dumbs down the content. The history is straight, clear, and unfudged. Oh what a joy and a relief this is to come across. I have studied the Angevin period for more than forty years. 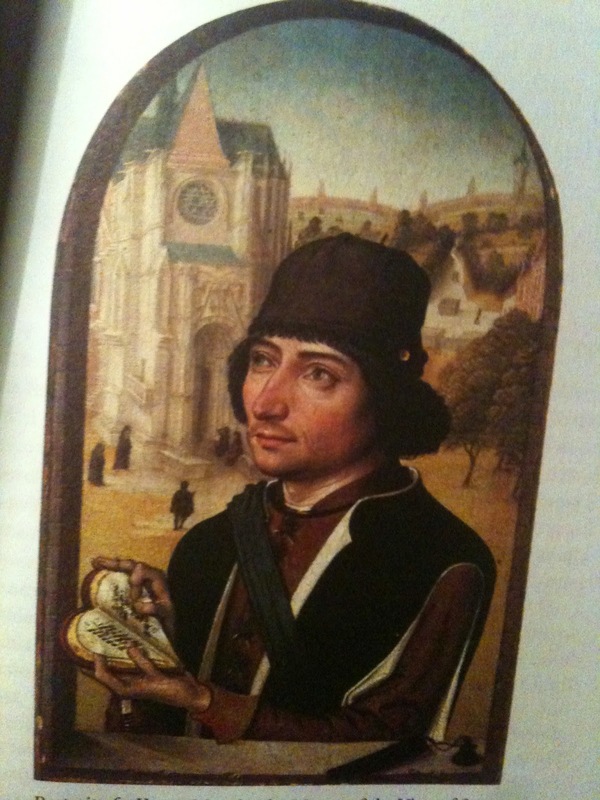 I'm not university trained, but I am very well read in non fiction works of this era (12th and 13th centuries). Often the academic studies are dry and soporific. The eyes glaze over, the same 5 pages take an hour to read and the information doesn't stick, but unabsorbed, just passes through. Unfortunately the popular books with a less dense writing style are frequently unreliable and have to be double-checked and taken with large pinches of salt. Dan Jones, however, walks a perfect line between the popular and the academic. He puts over the need to know material with depth and complexity while telling it in a vibrant way that hold the reader's attention. That's a very rare talent indeed. The book itself is a tactile thing of beauty. It's ornate, with gold embossing on the cover to give that added luxurious feel of holding the real thing in your hand. The paper is of thick, fine quality,perhaps gently hinting at parchment. The rich ornamentation and fabulous illustrations are put together in an uncluttered way that means the book is simple and practical to use. It is divided into ten easily digestible chapters beginning with an introduction that sets the scene and discusses the fame of Magna Carta and then continues to the historical background including an assessment of the reign of King John, not forgetting the input of his predecessors. 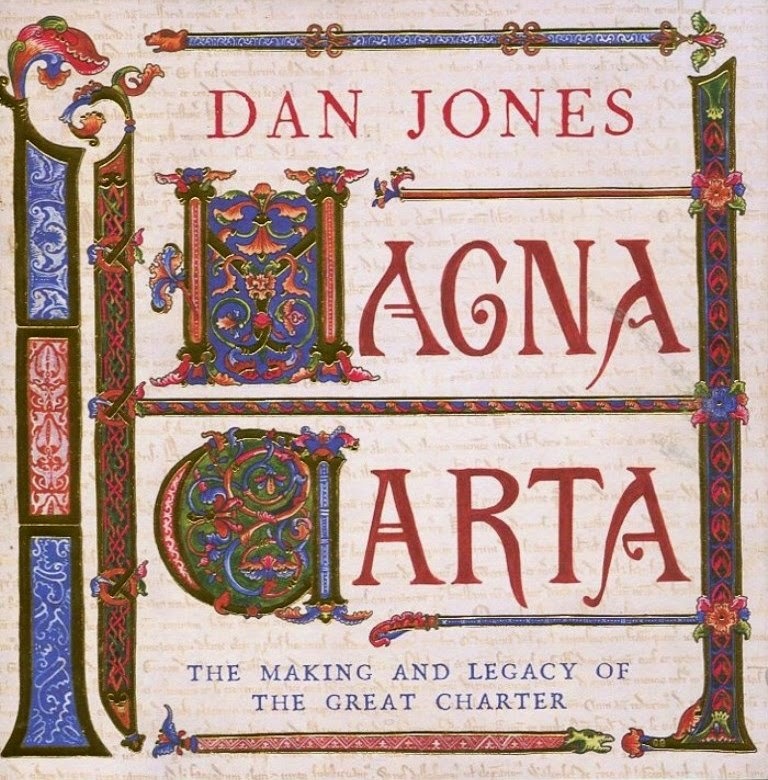 He might have brought about Magna Carta by his policies and the way he dealt with his barons, but he wasn't acting in a vacuum and Dan Jones takes us through the wherefore and the why. There is a section on what happened between 1215 and now, and a couple of wonderful quotes from David Cameron and Winston Churchill which made me laugh - albeit wryly. Dan Jones has a wicked sense of humour and appreciates the ironies. Section heading from the contents. 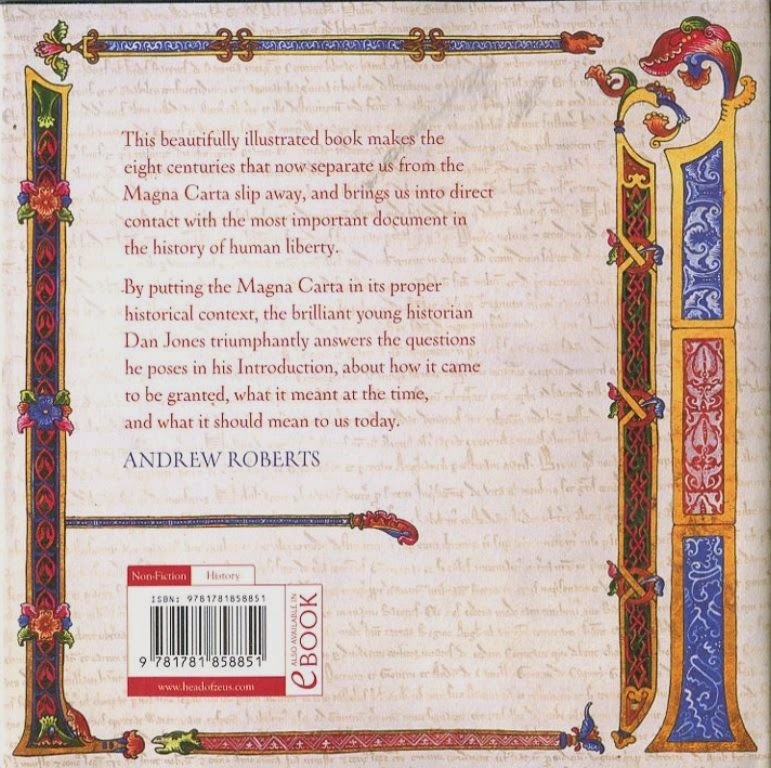 Having guided us through the history, the book follows with several appendices including the full text of the Magna Carta in the original Latin with an English translation alongside so the reader can see the exact wording for themselves. There are interesting short biographies of the barons involved in witnessing and enforcing the charter, and a timeline of the charter from its origins to where it sits now. By the end of the book the reader has been given an in depth history lesson but in such a way that there's not a single moment of eye-glaze or stodge. Hooray! There are copious illustrations and page breaks that will suit those with shorter attention spans but at the same time, those who prefer a meaty read will not be let down. There's a lot of learning crammed into these 190 pages. Any caveats? I suspect that there may be a few raised eyebrows among those in the know about the comment accompanying the illustration of King John's tomb in Worcester cathedral. The caption says it's made from 'carved wood' when it fact it's Purbeck marble. It seems a pity for that one to have slipped through the editorial net when King John is one of the major players. However, that really is a nit-pick when compared with the rest of the book's excellent content. Highly recommended. Everyone rush out and get a copy for your bookshelves. It's one of those heirloom reference works that will stand the test of time - a bit like the charter itself! carols crossing No Man's Land uninjured. exchanging food instead of bullets and shells. permit it to happen, even inside our heads. a different kind of hero. We were there, we were part of it. believe it might ever be true? There were outbreaks of peace along the Eastern Front too.